Set in 9 hectares of landscaped gardens leading to a sandy beach, Vivanta by Taj Fishermans Cove is ideally placed for enjoying local sightseeing and relaxed downtime. The accommodation is of a very high standard. All room are spacious, have en-suite bathroom, satellite TV and free Wi-Fi, and you can help yourself to a hot or cold drink to enjoy at your leisure. Deluxe rooms, cottages and villas have private outdoor space, while superior rooms have picture windows with views of the gardens or Bay of Bengal. There's plenty to keep you occupied, with tennis, badminton, beach volleyball and a gym for sports enthusiasts, and a swimming pool, spa and beauty salon for those preferring to take life a little easier. 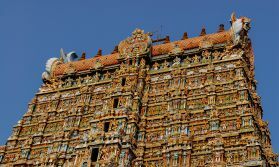 Staff can arrange excursions to local places of interest such as the UNESCO World Heritage Site of Mamallapuram with its renowned cave and stone-cut temples, and to Chennai and Pondicherry, all within easy reach. Closer to home to you can make use of one of the hotel's bikes to explore the area for yourself, and if you're staying between December and March you can join a guide on a turtle walk along the beach. Dining is a highlight, with 3 restaurants offering a range of cuisines and dining styles. Savour seafood by the beach at Bayview, choose between Indian, Chinese and continental fare at Seagull by the pool, and relax in the casual ambience of Upper Deck as you enjoy grills, pizzas and freshly-made pasta dishes, not to mention the delicious cakes and puddings. For a special treat staff can arrange a private candlelit dinner in the gardens or by the beach. Anchor Bar serves tasty snacks as well as tempting drinks, and you can indulge in a refreshing cocktail at the swim-up bar. Open: Vivanta by Taj Fisherman’s Cove is open all year. Location: The hotel is on Covelong Beach in the Bay of Bengal, 32kms from Chennai. It is set in 9 hectares of grounds. Rooms: Accommodation is in 128 rooms, cottages and villas. All are en-suite, have hot drinks maker, minibar, satellite TV, IDD phone and a supply of toiletries. Superior rooms (27sqm) are in the main building, have ceiling fans and picture windows with sea views. Deluxe rooms (43sqm) are on the ground floor in a separate wing and are contemporary in style with high ceilings and plate glass doors opening on to a terrace looking out onto the gardens. They have large bathrooms, and are equipped with air conditioning. The individual cottages (34sqm) come with a private terrace and seating area with a garden or bay view, and have open-air showers as well as a bathroom with bathtub. Villas (39sqm) face the Bay of Bengal and have private gardens with hammocks, where secluded meals can be arranged. There is 24-hour room service. Activities: Relax on the beach, play beach volleyball or beach cricket, walk in the gardens, go land zorbing or water zorbing in the pool. There are facilities for tennis, badminton, table tennis and pool, plus a gym. Yoga classes can be arranged. Bikes are available for independent exploring. You can visit the temples at Mamallapuram, a 20-minute drive away. Sightseeing trips to Chennai and Pondicherry are available. From December to March hotel guests can watch Olive Ridley turtles laying their eggs and see the hatchlings make their way back to the sea. Facilities: There are 3 restaurants (see below for more details), and 2 bars: The Anchor and Sunburst by the pool. The lobby is bright and spacious and leads out to a terrace. The hotel has a large freeform outdoor swimming pool with a swim-up bar and a deck with sunny and shaded space. Jiva Spa offers a range of treatments including traditional Indian therapies. The hotel has a beauty salon. The fitness centre has weights, circuit training and cardiovascular machines. Personal training can be organised. There are tennis and badminton courts and indoor games. Other facilities include a library and gift shop. There are golf buggies to transport guests around the hotel complex. The hotel has a currency exchange service. Dining: Bayview specialises in seafood, served outdoors by the beach, and is open for lunch and dinner each day. Seagull, open from 07:00 till 23:00, provides a choice of cuisines, and Upper Deck offers casual European bistro-style dining including freshly baked pizzas, home-made pasta, sandwiches and burgers between 16:00 and 19:00, served al fresco. Private meals in the gardens, on the beach or in the watch tower overlooking the bay, can be arranged. An exciting combination of rural South India, the key ancient temples, cardamom and tea plantations, and the backwaters of Kerala. "We loved the location with our cottage overlooking the sea and the staff were very helpful and friendly. An excellent place to start our holiday."